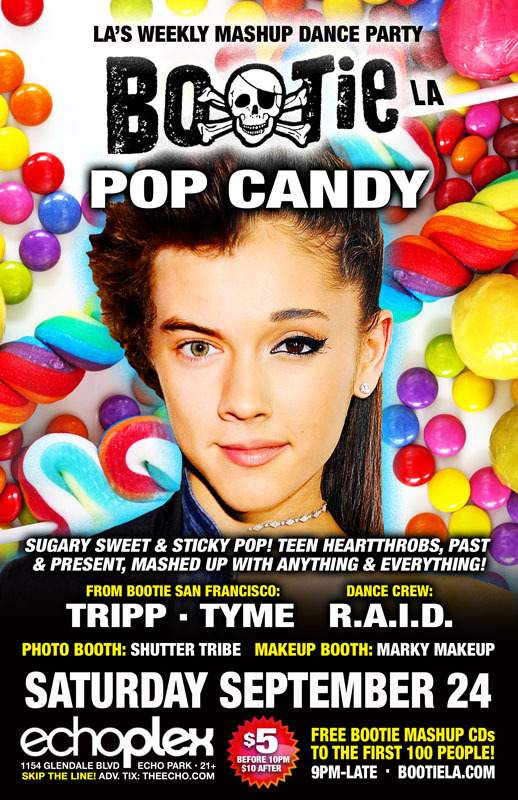 It’s a night of sugary sweet pop beats, as Bootie mashes up teen heartthrobs past and present with anyone and everyone – it’s Pop Candy! Only $5 before 10 PM! Sugary sweet and sticky pop! Teen heartthrobs, past and present, mashed up with anything and everything! Bootie pays tribute to the sweetest pop music to ever be delivered by a teen idol and mashes it up with anybody and everybody! Justin Timberlake or Justin Bieber? Britney Spears or Christina Aguilera? Backstreet Boys or N’SYNC? TLC or Destiny’s Child? Duran Duran or Depeche Mode? No pop artist from any decade is safe from the Bootie mashup treatment! Mashup DJs Tripp and Tyme come down from Bootie SF to spin pure sugar on the dance floor, while resident dance crew R.A.I.D. (Random Acts of Irreverent Dance) takes over the stage with their usual go-go antics as well as the Midnight Mashup Show, while Marky Makeup gives your faces and bodies a sweet makeover, and Shutter Tribe captures all the fun! All this, plus FREE Bootie mashup CDs for the first 100 people through the door!